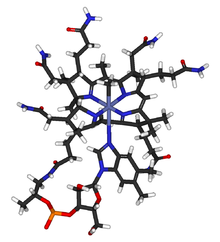 Methylcobalamin (mecobalamin, MeCbl, or MeB12) is a cobalamin, a form of vitamin B12. It differs from cyanocobalamin in that the cyano at the cobalt is replaced with a methyl group. 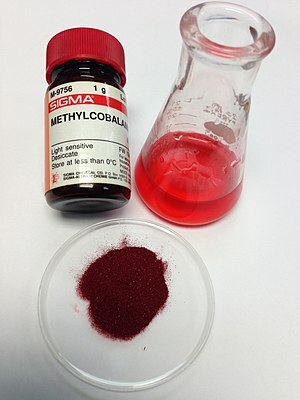 Methylcobalamin features an octahedral cobalt(III) centre and can be obtained as bright red crystals. From the perspective of coordination chemistry, methylcobalamin is notable as a rare example of a compound that contains metal-alkyl bonds. Nickel-methyl intermediates have been proposed for the final step of methanogenesis. Methylcobalamin is equivalent physiologically to vitamin B12, and can be used to prevent or treat pathology arising from a lack of vitamin B12 intake (vitamin B12 deficiency). Methylcobalamin is also used in the treatment of peripheral neuropathy, diabetic neuropathy, and as a preliminary treatment for amyotrophic lateral sclerosis. Methylcobalamin that is ingested is not used directly as a cofactor, but is first converted by MMACHC into cob(II)alamin. Cob(II)alamin is then later converted into the other 2 forms, adenosylcobalamin and methylcobalamin for use as cofactors. That is, methylcobalamin is first dealkylated and then regenerated. According to one author, it is important to treat vitamin B12 deficiency with hydroxocobalamin or cyanocobalamin or a combination of adenosylcobalamin and methylcobalamin, and not methylcobalamin alone. 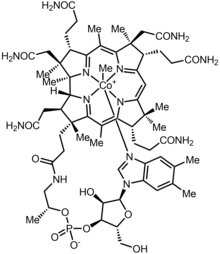 Methylcobalamin physically resembles the other forms of vitamin B12, occurring as dark red crystals that freely form cherry-colored transparent solutions in water. Methylcobalamin can be produced in the laboratory by reducing cyanocobalamin with sodium borohydride in alkaline solution, followed by the addition of methyl iodide. This vitamer is one of two active coenzymes used by vitamin B12-dependent enzymes and is the specific vitamin B12 form used by 5-methyltetrahydrofolate-homocysteine methyltransferase (MTR), also known as methionine synthase. Methylcobalamin participates in the Wood-Ljungdahl pathway, which is a pathway by which some organisms utilize carbon dioxide as their source of organic compounds. In this pathway, methylcobalamin provides the methyl group that couples to carbon monoxide (derived from CO2) to afford acetyl-CoA. Acetyl-CoA is a derivative of acetic acid that is converted to more complex molecules as required by the organism. Methylcobalamin is produced by some bacteria. It plays an important role in the environment. In the environment, it is responsible for the biomethylation of certain heavy metals. For example, the highly toxic methylmercury is produced by the action of methylcobalamin. In this role, methylcobalamin serves as a source of "CH3+". A lack of methylcobalamin can lead to megaloblastic anemia and subacute combined degeneration of the spinal cord. ^ L. R. McDowell. Vitamins in animal and human nutrition. Booksgoogle.com. Retrieved 28 January 2018. ^ a b David Dophin. Preparation of the Reduced Forms of Vitamin B12 and of Some Analogs of the Vitamin B12 Coenzyme Containing a Cobalt-Carbon Bond. D.B. McCormick and L.D. Wright, Eds. 1971;Vol. XVIII:34-54. ^ "EISAI SUBMITS NEW DRUG APPLICATION FOR MECOBALAMIN ULTRA-HIGH DOSE PREPARATION AS TREATMENT FOR AMYOTROPHIC LATERAL SCLEROSIS IN JAPAN" (PDF). Eisai.com. Retrieved 28 January 2018. ^ "A Human Vitamin B12 Trafficking Protein Uses Glutathione Transferase Activity for Processing Alkylcobalamins". Journal of Biological Chemistry. 284: 33418–33424. doi:10.1074/jbc.M109.057877. PMC 2785186. ^ "Processing of alkylcobalamins in mammalian cells: A role for the MMACHC (cblC) gene product". Molecular Genetics and Metabolism. 97: 260–266. doi:10.1016/j.ymgme.2009.04.005. PMC 2709701. ^ "Genetic disorders of vitamin B12 metabolism: eight complementation groups – eight genes". Expert Reviews in Molecular Medicine. 12. doi:10.1017/S1462399410001651. PMC 2995210. ^ Thakkar, K.; Billa, G. (2015-01-01). "Treatment of vitamin B12 deficiency-methylcobalamine? Cyancobalamine? Hydroxocobalamin?-clearing the confusion". European Journal of Clinical Nutrition. 69 (1): 1–2. doi:10.1038/ejcn.2014.165. ISSN 1476-5640. PMID 25117994. ^ Fontecilla-Camps, J. C.; Amara, P.; Cavazza, C.; Nicolet, Y.; Volbeda, A. (2009). "Structure–function relationships of anaerobic gas-processing metalloenzymes". Nature. 460 (7257): 814–822. doi:10.1038/nature08299. PMID 19675641. ^ Bémeur, Chantal; et al. (2011). Blass, John P. (ed.). Neurochemical Mechanisms in Disease. Springer. pp. 112–3. This page was last edited on 18 March 2019, at 15:39 (UTC).